That press is made of what??? 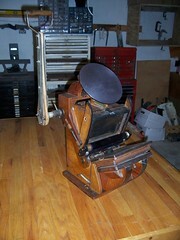 Letterpress isn’t all about cast iron presses, in fact there are a wide variety of machines out there. A while back we wrote about a new Adana press that was being manufactured in Japan. So when we came across pictures of this plywood press made by a machinist (Chris Vanderbroeck) from Ann Arbor, Michigan in 1960 we had to share them with you. The press was built around a Kelsey 5×8 chase and is constructed primarily from plywood and readily available hardware with specific parts machined from masonite and aluminum. Surprisingly, plywood is incredibly strong and has held up over the years although some of the adhesive in the plywood has begun to deteriorate. The press has some great features including custom built tympan bales and a specially constructed clip which holds the chase in place. If you’ve ever used or taken apart a press like this you can understand the complexity and precision involved in making a press like this. This is certainly a one-of-a-kind machine that demonstrates the craftsmanship of the machinist who made it.